A major figure of Australian pop art during the 1960s and 70s, Martin Sharp is renowned for his cartoons, collages, paintings and designs for posters and album covers epitomising pop's rejection of tradition and its love of colour, figuration and irony. 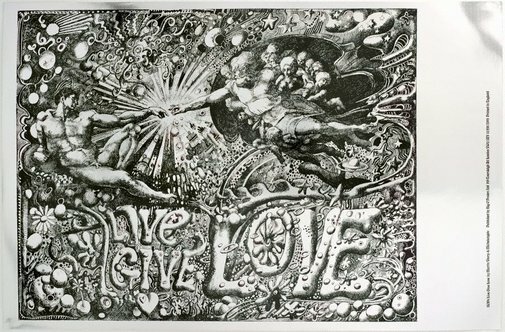 Sharp is internationally recognised for the originality and impact of the psychedelic images he created whilst living in London during the 1960s, when he was working as art director of the underground magazine Oz with Richard Neville and others. Oz epitomised the anti-establishment era of the 1960s with its irreverent, satirical and often controversial take on topics as diverse as police brutality, censorship, homosexuality and abortion. During his time in London, Sharp established a strong reputation as a graphic artist, designing psychedelic posters and album covers for musicians and bands including Bob Dylan and Cream. His poster designs in the so called 'decadent' graphic style inspired Oz magazine associate Peter Ledeboer to set up Big O Posters in September 1967, to produce, promote and distribute all his work in this sphere and a number of these images (including 'Jimi Hendrix') are regarded as icons of the era. 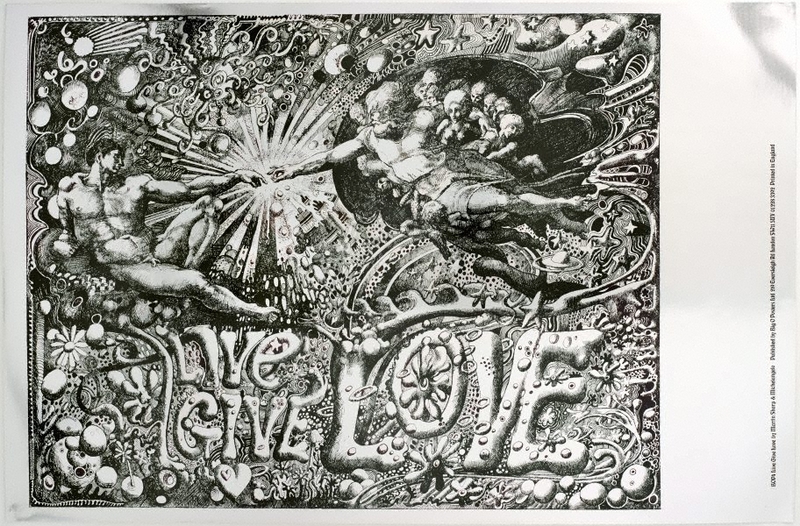 'Live Give Love' 1967 incorporates Michelangelo's painting 'The creation of Adam' from the ceiling of the Sistine Chapel in Rome into a larger explosion of bubbles, hearts, flowers, stars and planets to evoke the ethos of the era. Wayne Tunnicliffe, Pop to popism , ''The easel did not go pop: it went bang! ': Australian pop art', pg. 137-186, Sydney, 2014, 168 (colour illus. ), 304, 325.